Imagine what would happen if you could transport someone from 1916 to today. What would they think of all the technological advances we have made? Could they understand everything that a smartphone can do? Would they be amazed by the many features on automobiles? And would they recognize the technology they would see at dentist offices like Sunrise Dental? Technology has made our lives better in many ways (and worse in some). In dentistry, new technologies have helped us diagnose problems earlier and plan ahead for treatments. We have invested in equipment that makes a difference for patients at all our dentist offices in Durham, Raleigh, Cary, and Chapel Hill. Today, we will discuss some of the equipment you will find in our offices and how we use it to improve the dental care that we provide. Intraoral Cameras The human eye is a remarkable organ. It’s many parts allow us to see objects at long distances and to find small things on the ground. The eye also has a remarkable ability to focus on the things that we want it to focus on, whether that object is right next to use or on the other side of a room. Our dentists and hygienists certainly use our eyes to look for plaque and tartar. We watch for symptoms of gum disease, and we look for discoloration of the soft tissues in our patients’ mouths. We also know that the human eye has limits. That’s why we invented microscopes and telescopes to see things smaller and farther away than we can on our own. It’s also why we used intraoral cameras in our practice. These cameras allow us to make a much, much closer look at your teeth. They also allow us to examine your teeth angles that are not possible with other kinds of dental equipment. This offers some important advantages for you. With an intraoral camera, we can see tooth decay developing sooner than we could otherwise. Early detection leads to much simpler, less invasive, and more effective treatments. Cone Beam CT Scan Cone beam computed tomography has become a valuable tool for dental professionals. Cone beam scanners were designed using similar technology as CAT scans used by hospitals. CAT scans piece together digital slices (virtual cross-sections) that can be pieced together by a computer to create a single image. Cone beam scanners are a smaller version of CAT scan. 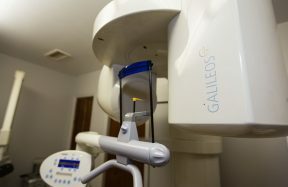 When you sit in a cone beam machine it takes hundreds of images of your teeth and supporting structures from all angle in a matter of a few minutes. When those images are combined, they give our dental professionals a complete picture of your teeth and a better understanding of the condition of your jaw. Those individual images can be used to created a three-dimensional model of your teeth and jaw. If you are a patient who has ever gagged while the dentist was making an impression of your teeth, you will appreciate not having to worry about that at our office. This isn’t just some novelty equipment. With these models, we can do a better job of preparing your treatment. For instance, dental implants have become more and more common as a tooth replacement. Where we place implants is important. We don’t want to put them where they could damage nerves, especially in the lower jaw. Before cone beam technology, dentists had techniques to estimate where it would be safe to place an implant. With our three-dimensional models, we have a more accurate understand of where everything is in your mouth. As a result, we can plan implant placement more precisely than ever before. This also helps patients who may be preparing to have their teeth straightened. Our models can give us a better understanding of what needs to happen during orthodontic treatment, such as Invisalign. Five-Year Guarantee Our technology combined with our training has also given us confidence in the work that we do. To qualify for this guarantee, all you need to do is continue visits us a few times each year for routine care. Technology has improved the quality of the work that we do. Learn More About How Technology Can Improve Your Dental Care If you live anywhere in or near the Research Triangle, then we welcome you to visit any of our offices to learn more about the technology that we use daily. You can reach any Sunrise Dental by calling that office or by filling out our online form to make an appointment.